As another year comes to a close, so do many tech concepts, products and services. 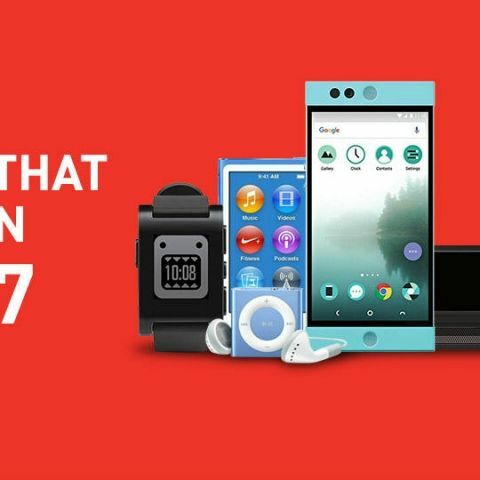 Let’s take a look at the technologies that weren’t able to make it this year. Google shut down its group messaging app called “Spaces” on April 17 this year. Even though the app was meant to rival WhatsApp, it seemed more like a group forum app. Spaces allowed users to start conversations based on a specific topic and invite other people to it. However, Google was also working on its AI-powered chat app Allo around the same time, which is the speculated reason behind Spaces being discontinued. Google said, “we've decided to take what we learned with Spaces, and apply it to our existing products.” Allo, similar to Spaces, can also directly pull in information into a conversation using the Google Assistant. Groove Music was Microsoft's attempt to rival popular music streaming services from Apple and Google. But the service never took off and the company partnered with its rival Spotify to provide music streaming service to its customers. The service was initially called Xbox Music, which was later rebranded to Groove Music by Microsoft back in July 2015. It will be discontinued on December 31, 2017. Jawbone sold wireless audio products before betting it’s future on fitness trackers. The company manufactured the UP series fitness trackers, but they failed to get traction, resulting in a financial crunch for the company. Jawbone liquidated it’s assets in July this year after it entered into a legal battle with its rival Fitbit. The company’s CEO, Hosain Rahman moved to a new company called Jawbone Health Hub, which focuses on "clinical-grade fitness trackers." Back in October this year, Microsoft officially announced the demise of its motion-sensing depth camera, Kinect. This was inevitable as the company shifted its focus to other VR and mixed reality based devices like Hololens. Matthew Lapsen, GM of Xbox Devices Marketing said, “And like all product launches, you monitor that over time, you learn and adjust.” Microsoft said that even though Kinect’s production might have stopped, the device’s “core sensor” technology is still being used in many other fields. The core sensor also powers Microsoft’s augmented reality headset Hololens. Juicero was a Wi-Fi connected juicer which cost $700 (Rs 45,000 approx) at launch. It made cold pressed juice using its own proprietary “Produce Packs” and couldn't work with anything else. However, Bloomberg reported that the same result could be achieved by simply squeezing the packets yourself. After the revelation, the company promised to lower Juicero’s price and dropped it to $400 but was still struggling to find buyers. Once a promising startup which raised more than $118 million in funding, Juicero closed shop by September with its homepage saying, “Today, after selling over a million Produce Packs, we must let you know that we are suspending the sale of the Juicero Press and Produce Packs immediately.” The juicer was released in the U.S and didn't make its way to India. Even though this device didn't make it to Indian shores, news of how the company handled the product’s demise did. Logitech announced the Harmony Link hub in 2011, which allowed smartphones and tablets to double up as a universal remote for numerous devices. A product being discontinued is nothing new, however, it’s surprising how the company handled it. Users simply received an email which said, “On March 16th, 2018, Logitech will discontinue service and support for Harmony Link. Your Harmony Link will no longer function after this date,” Which meant that all the Harmony Link devices will be bricked on the specified date. Logitech offered a free upgrade to the Harmony Hub for users whose Harmony Links were still under warranty and the ones outside the warranty period got 35 percent off while buying a Hub from Logitech’s store. Of course, many users were unhappy with the company’s decision and took to Reddit to vent their anger after which Logitech offered to upgrade their Harmony Link for free. Microsoft announced that it is ending support for its Windows Phones 8.1 on July 11 this year. Just next month after the announcement, a senior executive said that the company will no longer develop new features or hardware for Windows 10 mobiles. Low volume of users and high losses forced Microsoft to declare the demise of Windows Phones, even after the company tried incentivising app developers and even writing apps for them to keep its mobile division afloat. Microsoft also said that they will continue support for existing products with timely bug fixes and security updates. In October this year, AOL Instant Messenger’s parent company Oath announced that it was discontinuing the messaging service. AIM was released almost 20 years ago and it was one of the biggest messaging platforms during the late 90’s. Michael Albers, VP of communications at Oath said that the reason behind AIM’s demise is the “Profound” change in ways which users communicate. The AOL Instant Messenger was abandoned over time for mobile apps like WhatsApp, Messenger and others. Apple axed it’s iPod Nano and iPod Shuffle MP3 players on July 27, 2017. Both the devices were first introduced in 2005 but weren’t updated in years. iPods not running on iOS were rendered obsolete when the iPhone was launched in 2007 as it encompassed all of the iPod’s capabilities. Apple removed both the iPods from its online stores and websites worldwide this year indicating that only the updated iPod Touch will now be available for purchase. This move by the Cupertino based company indicated their transition to only iOS-based products. The premium smartphone maker Vertu shut down in July this year. The company was founded by Nokia in 1998 with the mission of selling luxury smartphones. Vertu mobiles were encrusted with precious gems, metals, premium leather, and would easily cost more than $300,000. However, Nokia sold the brand in 2012 to revamp its smartphone business and it was again re-sold to a Turkish businessman Hakan Uzan this year. Vertu made niche products targeting niche audiences, however offering precious stones didn’t cut it as their offerings severely lacked utility. With their customers dwindling over time and a deficit of £128 million, the company went under. In January this year, Razer acquired Nextbit and retained its entire team. Soon after, the company’s sole smartphone, the Nextbit Robin, was discontinued. However, the company promised hardware support for the next six months, which ended in August, and software updates with support for a year. The cloud-based smartphone tried to solve storage woes by uploading a user’s apps and files to its “Smart Cloud”. We reviewed the phone and found that except for its looks and unique design, it didn’t have anything much going for it. It was speculated that as the Nextbit team worked independently under Razer, a Robin 2 mobile might be in the works. However, the gaming hardware manufacturer came up with its ‘Razer Phone’ whose design was inspired by the Nextbit Robin. The Razer Phone is the first smartphone to feature a display with 120Hz refresh rate and the company says that the device is “made for gaming”. Google announced last year that Chrome Apps will soon be removed from Windows, Linux and Mac, and the company eventually did the same earlier this month. The “app” section was removed from the Chrome Web Store and users can’t install them anymore. Google killed the service as it didn’t observe many active users for it and said “Approximately 1 percent of users on Windows, Mac and Linux actively use Chrome packaged apps.” However, the company is now working on Progressive Web Apps (PWA’s) that are app-like versions of websites which offer a full-screen interface, an installable app icon, push notifications, and offline capabilities as well. PWA’s work across browsers and are already available for supported websites on Android. Google is planning to introduce the same for Windows by mid-2018. Although Pebble closed up shop in early December last year after being acquired by Fitbit, its devices continued to function through 2017. They will be rendered obsolete starting next year. Pebble smartwatches used e-paper displays to minimise power consumption and provide battery life of up to one week. The devices could be connected to any smartphone and the focus was to provide users insights on their health and fitness. The company developed low maintenance smartwatches, however with low sales, dipping profits and piling debts, the company was sold off as it couldn’t sustain in the declining wearables space. Google launched its Project Tango program in 2014. It enabled devices to get a better sense of their location in 3D space by using depth sensing technology and specialised camera setup which enabled working of AR apps. However, on December 15, Google announced the demise of its ambitious project and said that it will focus on ARCore instead. ARCore didn’t require any additional cameras, except the ones already present, for enabling the working of Augmented Reality apps on devices. Currently, there are only two Android devices which support Project Tango - Lenovo Phab 2 Pro and Asus Zenfone AR and even though Tango is discontinued, Google will completely end support for it on March 31, 2018.